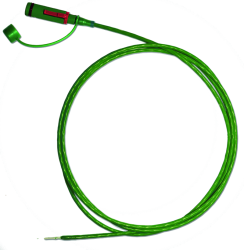 Thermo Sensor has developed a unique thermocouple sensor system, which is especially designed for applications in harsh environments with splash water. It consists of a mounting jack and the correspondent connector with a moulded thermocouple. Due to the systems purpose-built design, all components correspond to the protection class IP 65. Furthermore, all contacts and conductor materials are made of class 1 thermocouple material type K, which makes the system especially suitable for temperature measurement. The correct polarity of the connection is assured by correspondent guidance bars in both plug and jack. A safety clip prevents accidental disconnection. Two insulated thermocouple wires are inserted in the jack, which can be connected to the electronic control unit. The plug will be delivered with a moulded temperature probe. Generally, this would be a wire probe. Available are various diameters and insulations (e.g. teflon or kapton), depending on the particular application. Addionally, a version with a moulded-on mineral-insulated thermocouple is also available (with a diameter of up to 3.2 mm). 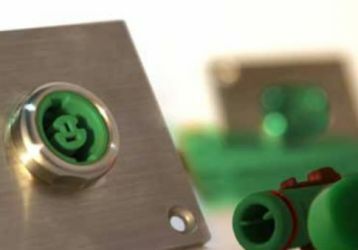 Both parts, plug and jack, can be sealed with caps while disconnected, so the protection of IP 65 is always guaranteed.